Trotternish is the most northerly of Skye's peninsulas, extending north from Portree to its eventual end at Rubha Hunish, and it contains some of the most striking landscapes in Scotland. 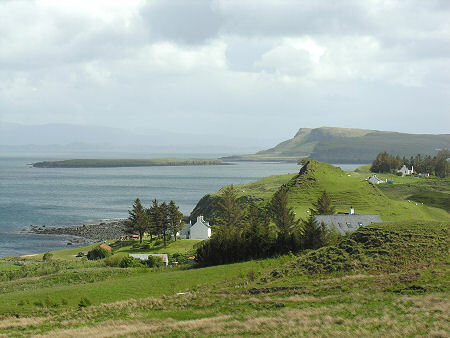 The road running up the east side of Trotternish leaves Portree and runs north past Loch Fada and Loch Leathan. For most visitors these lochs only serve as foreground to the main subject of interest. As you drive north your attention will increasingly be captivated by The Storr. This 719m summit rises above the east-facing cliffs that run down the centre of the peninsula for most of its length. 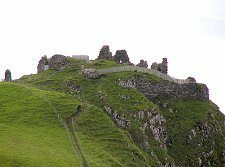 It is as if the entire eastern side of Trotternish slipped suddenly at some time in the distant past. 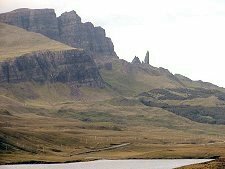 And if The Storr is not dramatic enough, sitting at the foot of its cliffs is a 50m high tooth of rock, the Old Man of Storr, so daunting it remained unclimbed until 1955. The Old Man is part of a weird wonderland of rock scenery and outcrops that lie below the cliffs. 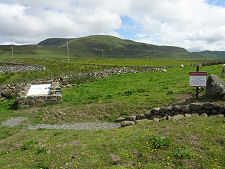 These, and The Storr itself, can be reached by popular paths from the main road at the north end of Loch Leathan. The road up the east coast takes you along a coast marked by spectacular rock scenery. 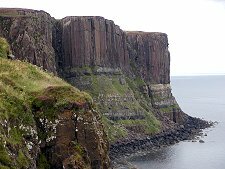 Best of all is Kilt Rock, 200ft high cliffs marked in an almost tartan-like pattern by the rock strata, and with a waterfall tumbling sheer to the pebbled shore below. 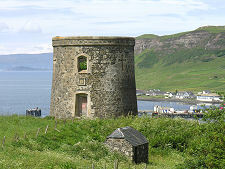 North again brings you to the main settlement on the east side of the peninsula, Staffin, overlooking Staffin Island and Staffin Bay, an unusually sandy bay for this part of Skye. 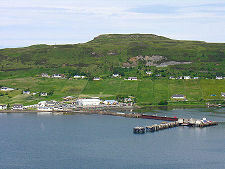 Staffin is an attractive crofting township with a number of shops and other services. A newer addition is the beautifully designed and constructed "Columba 1400" a community centre offering food and a range of other facilities. From Staffin a narrow road leads you across Trotternish to Uig via the Quirang, another example of the peninsula's weird rock architecture. 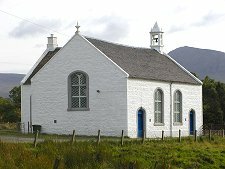 The main road north leads you instead through Brogaig to Flodigarry. 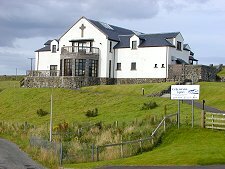 Today this is home to a hotel: in 1751 Flora MacDonald, settled in the cottage now in the hotel grounds with her husband, and had five of her seven children here. 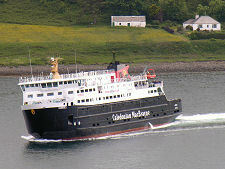 Offshore is Eilean Flodigarry. Here, it is said, 150 fairies once harvested the entire corn crop in two nights before demanding more work. At Kilmaluaig the road cuts across the very top of the peninsula, before turning to head south again at Duntulm, a settlement still in the shadow of the fragmentary remains of Duntulm Castle on its headland. This was successively an iron age broch and a Viking stronghold, before being used for a castle first by the MacLeods then by the MacDonalds. James V visited the castle in 1540. 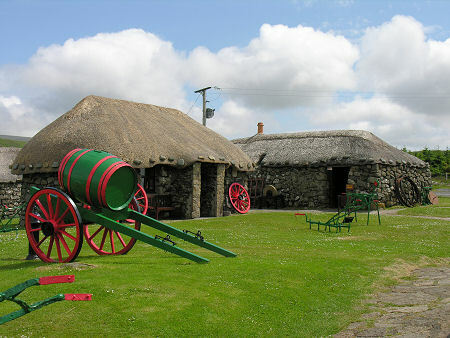 A little south of Duntulm is The Skye Museum of Island Life, an excellent museum comprising a fascinating collection of thatched cottages giving a feel for a crofting way of life long gone from Skye. 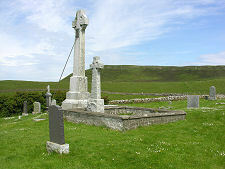 Close by is Kilmuir Graveyard, complete with a collection of fascinating graves, including that of Flora MacDonald. It was at nearby Monkstadt House that in 1746 she sought help for Bonnie Prince Charlie, disguised as her maid. 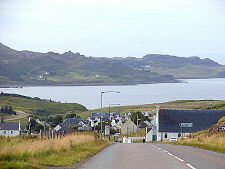 South again, past the intriguing Kilvaxter Souterrain, the road brings you to a crest overlooking Uig Bay, with the village laid out below you and around the head of the bay.